Channel + is a hybrid feminized strain very easy to grow, ideal for all growers. It is largely used as a medicinal strain to treat physical issues like injuries caused by fibromyalgia and multiple sclerosis. Channel + is a largely used for medicinal applications. 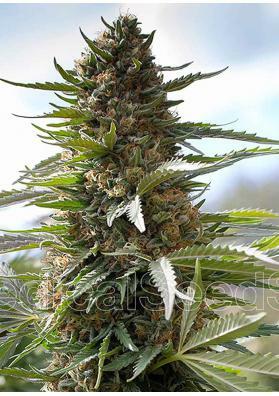 It is a hybrid feminized Cannabis strain , a cross between an enormous Big Bud and a sativa dominant Skunk. It is very easy to grow, ideal for all growers and all types of growing medium and systems. The effect is cerebral at first, becoming more body relaxing on a second phase and the THC and CBD content are high. For these reasons, it is widely used as a medicinal strain to treat physical issues like injuries caused by fibromyalgia and multiple sclerosis. It grows tall and vigorous, with narrow leafs, but shows Indica traits right at the beginning of the flowering period that is really fast. In a growing room and a growing period of 2-3 weeks you only have to wait 45-55 days to collect productions that can reach 600 grams per square meter. In the outside, the plant can reach sizes of about 3 meters and you can harvest amazing yields of around 1kg in late September (northern hemisphere).